The following colors are included: Tibet-Gold, Inca-Gold, Arabic-Gold, Gold-Pearl, Moon-Gold, Sterling-Silver. The pots can be removed and replacements are available. The following colors are included: Tibet-Gold, Bronze, Golden Orange, Red Brown, Red, Chocolate. The pots can be removed and replacements are available. The following colors are included: Gold Pearl, Rose, Red Violet, Deep Purple, Midnight Blue, Moss Green. The pots can be removed and replacements are available. 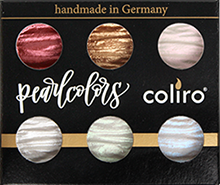 The following colors are included: Silver Pearl, Fine Gold, Copper Pearl, Fine Lilac, Blue Pearl, Green Pearl. The pots can be removed and replacements are available. The following colors are included: Blue Pearl (Shimmer), Green Pearl (Shimmer), Blue Silver, Blue Green (Shimmer), Moss Green, Midnight Blue. The pots can be removed and replacements are available. The following colors are included: Tibet Gold, Gold Pearl, Midnight Blue, Deep Purple, Silver Grey, Black Pearl. The pots can be removed and replacements are available. The following colors are included: Silver Pearl (Shimmer), Moon Gold, Bronze, Rose Gold, Mint, Silver Grey. The pots can be removed and replacements are available. The following colors are included: Sterling Silver, Rose, Lavender, Unicorn, Blackberry, Silver Grey. The pots can be removed and replacements are available. The following colors are included: Stardust, Arabic Gold, Golden Orange, Pink, Apple Green, Peacock Blue. The pots can be removed and replacements are available. The following colors are included: Tibet Gold, Moon Gold, Bronze, Rose Gold, Rose, Pink. The pots can be removed and replacements are available. The following colors are included: Sky Blue, Lagoon, Mermaid, Blackberry, Fiji, Apple Green. The pots can be removed and replacements are available. Special Edition with a unique new surface! These brand new colors are included: Sunbeam, Supernova, Deep Space, Dark Star, Meteor, Moonlight. The following colors are included: Silver Pearl (Shimmer), Fine Gold (Shimmer), Shining Pink (Shimmer), Red, Fine Lilac (Shimmer), Red Violet, Blue Pearl (Shimmer), Blue Silver, Green Pearl (Shimmer), Blue-Green (Shimmer), Bronze, Red-Brown. The colors are glued in and cannot be removed! The following colors are included: Red, Bronze, Shining Pink (Shimmer), Silver Pearl (Shimmer), Green Pearl (Shimmer), Blue Pearl (Shimmer). The colors are glued in and cannot be removed!